The Panasonic SD-YD250 2.5-lb Automatic Bread Maker is our best bread maker, which has 3 choices of loaf sizes and it can give you a peace of mind without being a clutter to your kitchen countertop. Be it breakfast or dinner, this bread maker has enough digital controls for you to customize your bread. It has a loaf capacity of up to 2 1/2 pounds and an audible beep signal. Our step-up pick is the Zojirushi BB-PAC20 Home Bakery Virtuoso Breadmaker and it can also make cakes and other wheat products and it can help you bake a large 2-pound loaf at home. With a nonstick bread pan for easier cleanup, the bread maker has a start and reset button that is easy to use. You can have a gluten free option for this bread maker for healthier bread. The budget pick is the Hamilton Beach Programmable Bread Machine 2-Pound and you can adjust your bread to your taste preferences with this unit and use the delay timer for your bread in the morning. It can help you make French bread with its many programmable settings and it also has room for your whole-grain and gluten-free recipes. Bread makers are heaven sent kitchen appliances that you can have at home. They are a simple and no-fuss way of making your own bread with your own raw ingredients. Also called bread machines, bread makers are a healthier option for a customized bread at home. You just pop in the ingredients, set the timer and you can have freshly baked bread within hours of time. Mixing is the first process that a bread maker does when you pour out the ingredients. After that, they do the kneading, which you might do by hand but the machine does it on its own. Rising and second rising comes afterwards and then the baking process follows. This is the very basic way that any kind of bread maker can make you freshly baked bread, or a loaf of bread to be specific. Bread machines also act as secondary ovens because they bake your bread. If you need to reheat your favorite loaf bread then you can just put it in the bread machine. You can also make recipes such as mashed potatoes and macaroni and cheese with the help of a bread maker, since it also bakes food. The basics of making bread go down to yeast, salt, water/milk and flour. Yeast and flour are the basics because they are the very essential to make any kind of bread. You can choose either water or milk when you want to make your bread recipe, depending on how you want it. Salt is added to add more flavor and an easy fermentation process to your bread. Many great settings can be present in a bread maker. For instance, you should have a dough cycle for custom kneading and a delayed bake time for scheduled baking purposes. A viewing window lets you check if the bread is doing alright. A keep warm or cool down feature is also good so that your bread is free from excessive moisture and it may also keep your bread hot and fresh. However, some people believe that viewing windows aren’t necessary because it will disturb the evenness of the baking process. For those who would like to save more on their bread making, or to simply go for a healthier option, you can actually buy a bread maker to make your own homemade bread, especially if the ingredients are easily accessible where you live. Those who live near thrift markets that sell raw ingredients for bread, such as yeast and flour, may be able to make their own bread at home with less expenses. Bread makers are beginner-friendly kitchen appliances because they only take a few settings and it will do the rest for your bread. You just need to learn the recipe of the bread and prepare the right ingredients, set the timers right and you have freshly baked bread within a few hours of preparation. Bread makers are so simple that even those without baking experience can handle them just fine. If you want to make bread in a breeze but don’t have a lot of time to clean up or to do it the traditional way, the bread maker is a great solution to that. Bread makers give you less cleanup time because it does almost everything for you, so you don’t knead (pun intended) to do much in the kitchen just to make bread. People are concerned with non-stick Teflon coating in most kitchenware, especially those who are meticulous about their health and safety. However, Teflon won’t easily break down in your bread maker because it does not heat up too much unlike a really large oven, so the Teflon has no chance of breaking down and contaminating your food at all. Bread makers, contrary to popular belief, can also actually save you more money in the long run when it comes to the electric bill. Since they have a small build, they have less chance of giving an impact to your next energy bill, so it is absolutely okay to use your bread maker for whenever you need it. Much like how home cooking and homemade ground coffee tastes better than supermarket and commercial ones, homemade bread will make you feel good inside and out due to its authentic taste and fresh aroma. Programmable: the bread maker should be programmable to your best needs depending on the recipe that you want for your bread, how much bread you will need and how much ingredients you will require on your bread recipe. Having a bread maker that is highly programmable when it comes to its timer, settings and on the whole process of making bread is important to achieve a high quality bread loaf for your home consumption or other needs. Gluten-free option: most people nowadays go for a gluten-free diet and they want bread that is gluten-free as well. You should have a bread maker that has an option for making gluten-free bread so you can eat healthily while you make bread at home. 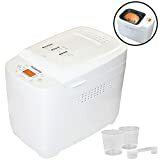 If you are a person who regularly consumes gluten-free products or cooks them at home then having a gluten-free option for your bread maker is important and highly significant. Size of loaf: from 1 to 2.5 lbs, you can choose the size of ideal loaf you would want to make with the bread maker. Smaller homes and needs may just go for the 1-lb option but bigger needs can go for as much as 2.5 lbs or depending on the recipe of your choice. Being able to make more bread is a good thing when it comes to any bread maker because it will save you more time in the long run. However, you can just go for a smaller option if you just live alone or don’t eat a lot of bread in general. Pizza option: a bread maker can also have the option to make pizza since it is also bread. Most bread makers have a dough option that allows you to take out the bread that has been kneaded and shape it to your favorite pizza or even roll to make your own custom bread that is intended for your homemade recipe of bread that is shaped in your own way. Fruit nut option: there should be an option to dispense your fruit and nut if you ever add them to your bread recipe. A fruit and nut dispenser is a great way to make raisin bread, banana bread and the like with the use of a bread maker. If you are a person who frequently adds a lot of natural ingredients and flavors to their bread then they can choose a bread maker with this option. Delay timer: a bread maker should have a delay timer so that you can have the option to bake the bread later on so you can have it fresh at breakfast or whenever you need it in the day. Scheduling a delayed baking time is important so that your bread will not get cold after you have baked it with the bread maker. The delay timer option is essential because you would want a bread loaf that is freshly baked. Yeast dispenser: do consider a bread maker that has a yeast dispenser for ease of cleanup. It is much like the fruit nut dispenser but works for the yeast, which is also a handy way of relieving you from cleanup jobs when you make bread in the bread maker. Home or professional use: if you buy a bread maker, make sure it is fit for your needs. Some bread makers are ideal for home use only but some can be used for professional purposes, such as for making breads and sandwiches for your business such as a café or restaurant. Ease of controls: do consider a bread maker that is easy to control and especially beginner friendly for those who are not into baking that much. The timers and the buttons should be conveniently located and easy to setup for anyone who is operating the bread maker. The user instructions in the manual should be easily readable, concise and understandable. Housing and durability: most bread makers that have a stainless steel body will last longer than those made of plastic, but they can be generally more expensive. It is up to you on what kind of housing you want for a bread maker depending on your budget and needs. Voltage system: do know the voltage or electrical system of your country or area when you consider any kitchen appliance such as a bread maker. 110 volts is for the U.S.A. while Europeans and some Asians use 220 volts. Nonstick coating: the nonstick coating of the bread maker should not easily wear off so that it will have no chance of getting into your bread. The heating process of the bread maker should not easily wear off the nonstick coating in the process by providing a low and slow baking process. Warranty policy: take note of the warranty policy of the bread maker and which parts of the bread maker are covered by the warranty. Our best bread maker is the Panasonic SD-YD250 2.5-lb Automatic Bread Maker and it is so easy to use because you just add ingredients and it will do the process for you. It is perfect for your homemade bread needs with just a touch of a button. It has many programmable menu options. With a 13-hour delay start timer, this bread maker packs a nice 550 watts of power for a powerful bread machine at home for making bread or for pizza. Your bread is easily removed with the nonstick design of this bread maker. 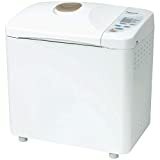 Perfect for a modern family, this is a good automatic bread maker for fresh bread baking anytime and anywhere. The bread maker gives you a variety of options for your bread in a compact designed machine with many settings for your electronic convenience. The bread maker gives you a lot of meal planning options such as for gingerbread or for regular white bread while choosing the freshest ingredients. It also automatically adds the right amount of yeast at the best time as a smart bread maker so you can add raisins at the right time. It can process whole wheat bread and make the perfect bread at the comfort of your kitchen. You can also make croissants and even multigrain options. The bread maker is okay to use for making pastries and it is also applicable for fruitcakes. With a build-in handle for easy carrying, the bread maker can also be used French bread and when you want to add dried fruits or even nuts to your bread. It has a handy yeast dispenser that makes the process of making bread at home easier. The non-stick inner bake pan is easy to clean and can help you make quick breads in no time. When you’re baking bread at home, you can get a warm loaf with the use of this bread maker. It can also help you make cakes. 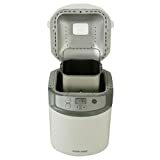 The only concern about the Panasonic SD-YD250 2.5-lb Automatic Bread Maker that isn’t really a deal breaker is the fact that its cooking bowl can be a bit of a hassle to clean because it is not dishwasher-safe, however it is okay because most kitchen utensils are best washed by hand anyway. The Zojirushi BB-PAC20 Home Bakery Virtuoso Breadmaker is our step-up pick which has a lot of custom menu settings and it can also make other foods such as jams, pizza and meat loaf. The bread maker has a total of 10 pre-programmed settings and you can bake bread at home anytime and anywhere. Your homemade bread will be freshly baked with a good smell with this bread maker. You can just add in measured ingredients and it will do the rest, ready to serve with dinner. Using organic baking ingredients, you can make your favorite healthy bred with the use of the LCD control panel. The bread maker has a longer loaf tub so you get more bread in the long run with an evenly browned crust. You can make your bread for breakfast in a breeze with its dual kneading blades. The bread maker also lets you choose from light, medium or dark crust shades. You can set the delay timer up to 13 hours for a fresh loaf of bread in the morning. The bread maker can also help you make homemade cinnamon-raisin bread and strawberry jam and has a large viewing window to see what’s baking and how it is doing. The bread maker can bake as fast as 2 hours of baking time and keeping the yeast dry is easy with this bread maker as well. You can choose from the variety of menu settings with this bread maker and it also takes care of the rest when you use it in your kitchen. It includes a measuring cup and also has the ability to handle rye flour for your recipe needs. the bread maker also comes with a measuring spoon for a precise bread recipe. Likewise, it can easily handle seeds and it can also help you make cinnamon rolls, pretzels, pizza, bagels, cakes and so much more. The bread maker gives you a consistent and even browning throughout the baking process and you also get an additional heater on the lid. The Hamilton Beach Programmable Bread Machine 2-Pound is our budget pick which has a total of 12 settings for you to choose. You can easily make rolls and pizza with this bread maker and it has a decent baking process that can also make it easy to help you make gluten-free bread. Any home baker will be pleased with the bread maker and its ability to knead the dough thoroughly. It can also process whole wheat and other heavier flour and it easily prepares dough for your needs of an even baking process. Great for novice to expert levels, it has a quick baking cycle. The bread maker is also quite easy to clean up when you finished using it. Moreover, it allows you to make quick bread with no yeast at all and you can also add seeds to your bread recipe. You can also choose 1.5lb or 2lb loaf sizes and you can make sweet bread out of it as well. With a safe and cool touch body, it is also easy to clean due to the dishwasher-safe pan. You get a lot of dough and cake options with this unit and add raisins to make raisin bread. You can also make flatbreads and you can make jams as well when you select the cycle or setting for your dietary needs. It can also process whole grain bread and will get the smell of homemade bread across your kitchen. You also get many crust settings with this bread maker that is easy to bake with. With 2 kneading paddles for ease of use, it also has nonslip feet for stability when you bake. With an audible notification for adding fruits and nuts, the bread maker helps you make gluten free bread that is fresh with the delay timer. You can also make croissants and you can select your loaf size depending on your needs. You can even make hand-tossed pizza from dough. Perfect for breakfast needs, the machine also works on 220v 50/60 Hz systems. You can also choose between light, medium or dark crust settings. 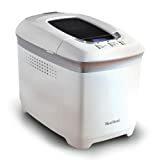 The Breville BBM800XL Custom Loaf Bread Maker is a great gluten-free bread maker with an automatic fruit and nut dispenser and can be used for just about any recipe for bread, such as gluten free bread. You can also make yeast free recipes in this bread maker. It easily releases ingredients and makes dough easily. You can also make whole wheat bread with this machine as well as sweet bread. It can make evenly incorporated ingredients with the dough and it also automatically computes temperature. You can also choose loaf sizes at 1, 1.5, 2 and 2.5 lbs. As an elegant bread maker with a collapsible kneading paddle for easy cleanup, it also adds fruits and nuts at the right time. You can also make yeast free products and ensure that the loaf of bread is freshly baked. It also thoroughly mixes ingredients and allows for custom recipes. With a large window on the top for easy viewing, it has a smart LCD screen for easy settings such as 3 crust colors for your choice. It can help you make artisan crusted bread or your favorite homemade jam in no time. With a progress indicator, it can help you create your own recipes such as crusty loaf. It has a total of 13 automatic settings as a bread maker that can handle basic bread recipes with kneading, rising and baking. Great for a small family, it has a total of 4 loaf sizes. As the saying goes, it can be your greatest thing (in the kitchen) since sliced bread. 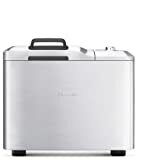 The Cuisinart CBK-200 2-Lb Convection Bread Maker is a convection bread maker that can make homemade spreads and has a non-stick pan for easy cleaning. If you want to have a gluten free diet then this is a great bread maker for dough preparation and it is quite sturdy. With a rapid bake setting, you can get warm bread in no time with this unit. It has a large digital display and it has many options as a programmable bread machine. With stay cool chrome side handles, you can make breads and other recipes and conveniently prepare loaves of homemade bread. It uses a convection fan for heating and baking your sweet cake or bread product. With a brushed stainless steel lid for durability, the speed and timing of this bread maker is good when you want to add mix-ins. You can choose 3 loaf sizes and its plastic components are BPA free and are food-safe. With 16 preset menu options, the bread maker also has a power failure backup and a glass viewing window for ease of monitoring. You can make your own low carb diet bread with this unit. It has an audible tone for adding your fruits and nuts and an LCD screen display for viewing the settings. You can make gluten-free in no time with this 680 watts kitchen unit and also make jam combinations as you want them. You can also use the artisan dough settings for your needs or use the bake-only option for your dough. It has a delay start timer of up to 12 hours and the nonstick kneading paddle is removable as well. With a total of 3 crust colors, it can also make pizza dough and it also includes a measuring spoon and a measuring cup. It is backed by a three-year limited warranty. The SKG Automatic Bread Machine 2 LB is a great bread maker for homemade bread for beginners. With a sleek design, it is quite sturdy due to the brushed stainless steel accents. Great for both novices and pros alike, the bread maker has a nonstick coated inner pan so it is easy to clean up. With a 15-hour delay timer, this lets you choose from 3 crust colors and make easy recipes for your bread. It can help you bake healthier bread and keep it safe in the kitchen with non skid feet. You can also make desserts like yogurt, jams and cake and add ingredients as you like. Made with food grade housing, it is safe to use and you can set the timer easily to make warm baked bread on the go with a total of 3 loaf sizes. This bread maker can handle up to 2-pounds of bread for larger families and has a nonstick handle for easy handling in the kitchen. This unit can take care of the rest with its enhanced design to make your fresh homemade bread. With a keep warm function up to 1 hour, the bread maker has 19 automatic programs to make your warm loaf of bread in an instant. With a viewing window, you can also make whole wheat bread. Fitting well on your countertop, you can make fresh breads easily and also make them gluten free. It also has a 15-minute power interruption recovery option. The Kuissential Bread Machine with Fruit/Nut Dispenser has a 13 hour delay timer and is a great bread maker to include finely chopped nuts into your bread recipe. It can handle French bread and sweet bread and keep it ready in the morning with a delay function. You can choose between 1.5 and 2 pound loaves of bread and make delicious homemade bread on the go. You can choose from whole grain bread, homemade bread, dough, cake and jams and you can also chose from light, medium, or dark crusts. It also includes a measuring cup and a spoon. The bread maker has gluten free bread and rapid baking along other 13 settings for you to choose from. It mixes all the ingredients well and it is also quite simple and easy to clean. With a 90 minute cycle dough process, it can handle different types of breads so it is easy making homemade bread with it. With a keep warm function, you can also make jams out of it and the machine does the rest for your multigrain bread or dough. It can also help you choose the color of the crust as you want and can handle almost any type of bread. There is also an auto-dispenser for fruits and nuts as we mentioned above and you can find it easy to put the ingredients into the bread pan. To make it easy for you to view the process, there is a viewing window on this bread maker. The T-fal PF311E ActiBread Programmable Bread Machine is a great and intuitive LCD screen powered bread maker that can allow you to choose between light, dark and medium shades of crusts and packs 700 watts of power. It is also applicable for pizza, dough, jam, cake, sweet bread and French bread. The bread maker is also applicable for rapid baking, gluten-free bread and whole wheat bread. The unit is also easy to use with its controls, has a stainless steel housing and is also equipped with a display window on the top lid so the bread maker is easy to monitor for your bread. With a total of 15 settings to choose from, the bread maker can also make pastas other than bread. It comes with a recipe book and a cup and spoon for measuring your ingredients. All of the parts of this bread maker are easy to clean up for your fast needs. The kneading blade of this bread maker is very effective at kneading dough in general. For you to choose your appropriate loaf size, the Black & Decker 1-1/2-Pound Bread Machine is okay to choose between 1.5 and 1 lb bread sizes for yourself or for someone else to share it with. The 13-hour delay timer ensures fresh bread in the morning. You can choose for the 12 baking settings for this bread machine and you can also keep your bread warm with a 1-hour setting. As a compact designed bread maker, it also has a large viewing window to see what’s going on and a baking pan that has nonstick coating. You can also add nuts and fruits to your bread with great ease. The audible signals tell you when to add your bread mixes. The West Bend 41413 Hi-Rise Loaf Breadmaker can go for up to 2 lbs of bread and gives your dough thorough kneading as much as possible. The bread pan is nonstick for easy cleanup and includes all the necessary materials such as a cup and spoon and the kneading blade. You can also use the bread maker for gluten-free recipes and the like. With a total of 12 settings for baking and 3 crust colors, you can also choose between 1.5 lbs or 2 lbs of bread. There is a delay timer option for up to 13 hours for freshly baked bread in the morning. There’s also a power interruption feature for constantly baked bread even during a power outage. It is an easy to use and beginner friendly bread maker that can make fresh smelling bread at home. Other bread makers did not make it to our list because they lacked in safety features and also did not make a lot of bread in just one go. They are also difficult to operate, which is not very convenient for those who are inexperienced when it comes to making homemade bread in a bread maker. Q: What is a bread maker and what does it do? A: A bread maker or a bread machine is a kitchen appliance that makes bread simply by putting your ingredients and setting it up according to the kind of bread that you want to make. Bread makers knead, rise and bake your bread all in just one machine within 2 to 3 hours or depending on the recipe of bread that you want to make. Q: What processes do bread makers go through to make bread? A: The entire process that a bread maker goes through to make you bread are the following: mixing, kneading, rising, second rising (also called knocking down and proving) and baking. You mix up the ingredients, the machine kneads it and the rest is history. Q: Can you make other recipes other than bread in a bread machine? A: Yes, many kind of recipes that can be used in a bread machine can work well for your dinner table. You can use it for turkey stuffing, mashed potatoes, desserts or anything that you would normally put inside your oven. Q: What are the four basic ingredients that you need for a bread machine? A: In making bread on a bread machine, you just need yeast, flour, salt and milk or water. The liquid will help mix the ingredients well, the yeast can also be a starter and fermentation and flavors are the purpose of salt. Q: What basic settings should be present in my bread maker? A: If you want to buy a bread maker then make sure it has dough cycle for those who want to knead pizza and rolls. You should also have a viewing window so you know what’s going on inside the bread maker. A delayed baking time is also good because it lets you set the time your bread will bake when you’re on the go. However, some bread makers don’t have a window because it will help a lot in keeping the heat evenly distributed as your bread bakes. Q: Is homemade bread cheaper than supermarket bread? A: It depends on the prices in your area but generally, you may be able to save more if you make bread at home with raw ingredients rather than buy it off the supermarket. Store bought bread usually has added tax and whatnot so you might be able to get more out of your homemade bread because it’s something from your own kitchen. Q: Can people who are not good at baking use a bread maker? A: Yes, the bread maker is specifically made for those who lack knowledge in baking and breads in general. The bread maker is a simpler way of kneading and baking your bread if you just take time to read the user’s manual and online recipes and such. Q: Is a bread maker less messier? A: Yes, for those who want less mess in the kitchen , you can have a bread maker to make your own bread without having to clean up a lot of kitchen items and utensils other than your bread knife and pan. Kneading the bread is done by the machine so you don’t have to get your hands messy at all. Q: If bread makers have non-stick Teflon coating, are they food-safe? A: Teflon coating does exist in bread makers, however, they will not get chipped off because the temperature should be at least 500 degrees F to break down Teflon, which will not be the case with bread makers, so they are really food-safe. Q: Can a bread maker save energy? A: Yes, a bread maker is actually quite eco-friendly and okay with your electric bill because it is a small appliance that does not heat up too much, unlike your large oven, by which you usually bake your bread and other pastries in a traditional way. Bread makers are great energy-savers in general. Q: Why is eating homemade bread healthier? A: Homemade bread is a healthier option over the supermarket counterpart because you have the power to choose your own recipes and ingredients and keep them as fresh as possible depending on your diet, needs or taste. If you don’t like adding a lot of unnecessary fats and calories then you can tone down the bread recipe and eat healthier. Q: Does homemade bread taste better than store bread? A: Yes, homemade bread is a great alternative to supermarket or store bread and it tastes better because you control the ingredients and you also don’t keep the unnecessary ingredients and extenders unlike in supermarket bread. Q: Can homemade bread lessen stomach bloating? A: Yes, people who are prone to food bloating and find harder time to digest food or eat bread might want to consider homemade bread with the use of a bread maker or a traditional oven baking process. Bread making at home is not just a fun activity but also a healthier option because you don’t make it too dense unlike in bigger commercial bakeries out there. A less dense bread is better because it makes you feel less bloated whenever you eat bread. Q: Can homemade bread help you lose weight? A: It can help you shape up because you can choose how much ingredients and calories to include in your bread. If you want to go on a low calorie diet then the best way is to make your own bread with a lower calorie count. Whole grain bread is a great thing to consider if you want to make bread at home because it also gives you natural fiber to help you slim down. Q: How do I make my homemade bread healthy when it comes down to ingredients? A: There are many ingredient options you can do when it comes down to choosing the right ingredients for your homemade bread. For instance, using honey instead of commercial sugar can help you minimize sugar content, or just don’t use any sweetener at all if you’re diabetic. Moreover, diabetics can also benefit from rye flour, which you can add to your homemade bread recipe because it is high in fiber and can also help those with heart problems. Gluten-free flour is what you may need to cut down on the sugars and the like. Q: Why should I eat whole grain bread? A: Whole grain bread is more than just a fad or trend – it is also a healthier option for your diet, especially if you want to slim down or get yourself away from harmful health conditions such as stroke, obesity, cancer and heart problems. You can also prevent hypertension and diabetes if you regularly intake whole grain bread, especially homemade bread. Q: Why should I eat gluten-free bread? A: Anything that is gluten-free has also been a big craze around the world, especially those who want to get fit and healthy, along with the trends of going herbal, vegan, vegetarian, etc. Gluten-free bread is a great alternative to your store bread because it is made from healthier ingredients such as soy, rice and corn. These gluten-free bread recipes are healthier and have less impact to your health and can be great for those who are going on some diet plan or just want a healthier option with their bread. Q: What is the difference between white bread flour and organic flour? A: If you are a beginner at homemade bread making then it may be best to stick with white bread flour first because it is generally easier for you to make bread with such a flour type. However, health experts do say that it is a lot better to use organic flour although it can be a bit harder to mix compared to commercial white flour. You can find many interesting recipes online on how to properly set the ratio of each kind or type of flour for your bread recipe. Q: What is the difference between baking in the oven and baking in your bread maker? A: While a bread maker doesn’t require a watchful eye, an oven does. You need to watch the oven all the time so that the bread will not get burnt on one side. While bread makers do things automatically, it may also still be wise to just get involved with your bread maker as well, much like how you watch over your oven as your bread bakes. Q: What bread pan is the best to use for making bread at home? A: A bread pan that has a non-stick coating is great if you don’t want to constantly grease your bread pan, and also to avoid getting a lot of fats from the oil. Corrugated bread pans are great to have when you want to bake bread at home because they ensure that the baking process becomes as even as possible throughout your bread mixture. Overall, the Panasonic SD-YD250 2.5-lb Automatic Bread Maker is our best bread maker which has many programmable options, up to 2.5 lbs of bread and a 13-hour delay timer.